Do you sometimes find yourself in a running funk? Do you have a deep down desire to train, but often just feel “bleh” or like skipping workouts? Maybe you’ve found yourself in a frustrating cycle where you start running only to walk away from it for weeks or months at a time before getting started yet again. 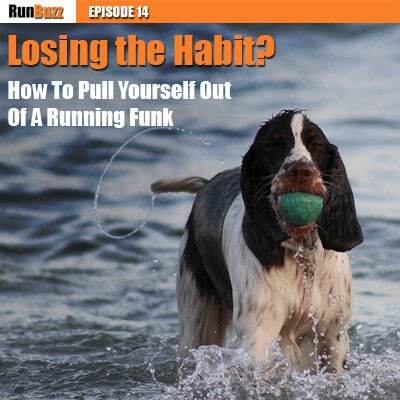 In this podcast, I share some practical steps to help any runner in a funk and some tried and true strategies for avoiding any future running funks. How do you continuously stay motivated and get out of a funk when you get into a funk? I’ll go through spurts and just quit running all together. It is usually before I have signed up for a race. I was signed up for my first half marathon in March and just up and quit running three to four weeks before the race. I finished the race at 2:59, but was miserable. I signed up for the 15k Boilermaker that was last weekend and backed out because I was not prepared as I had quit running for months. I am signed up for my next half marathon on 10/19/14 and just started a training plan this week. So far so good…but I am only three days into the training. What are your suggestions? The first thing you should know about running funks, or funks of any kind (be them relationship, career, health, etc.) is that they’re universal. Everyone seems to get in a funk or a rut every now and then. The frustration that we feel after we start falling into a funk often propels the funk forward and creates a negative reinforcement cycle that is incredibly difficult to escape from. Today, we’ll cover why this occurs and why overcoming a funk is so hard. This is such a universal problem that I really feel responding via podcast is the best way to make sure I completely respond to Sarah’s inquiry and make sure that all listeners understand why funks happen and what we can do to prevent them. How to use self-analysis to address the causes of funks and develop workable solutions. How to make realistic expectations. How to break out of a running funk. How to identifying trigger behaviors. Guilt spiraling and the importance of forgiveness. How to tell if you’re training too hard and if you should take a (planned) break. How to address your love/hate relationship with running in a blog. What the support of a community (like the RunBuzz Facebook community) can do to help you avoid running funks. Getting out of a funk is an extremely hard thing to do. No single tip seems to do it and it does take time, but pulling yourself out of one is completely possible. I hope you all have a great week and I look forward to getting back to all of you very soon.